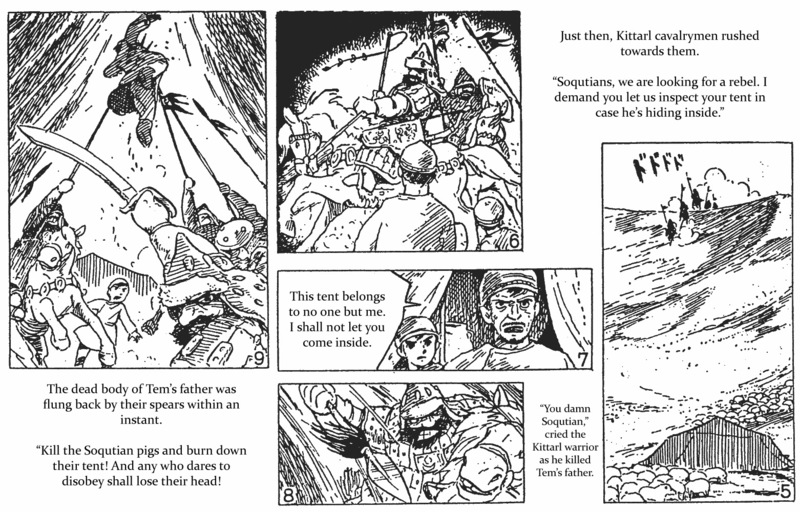 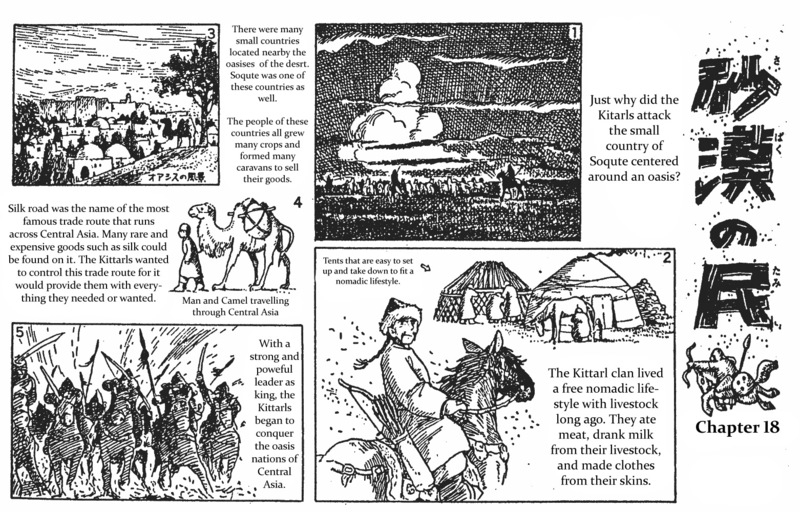 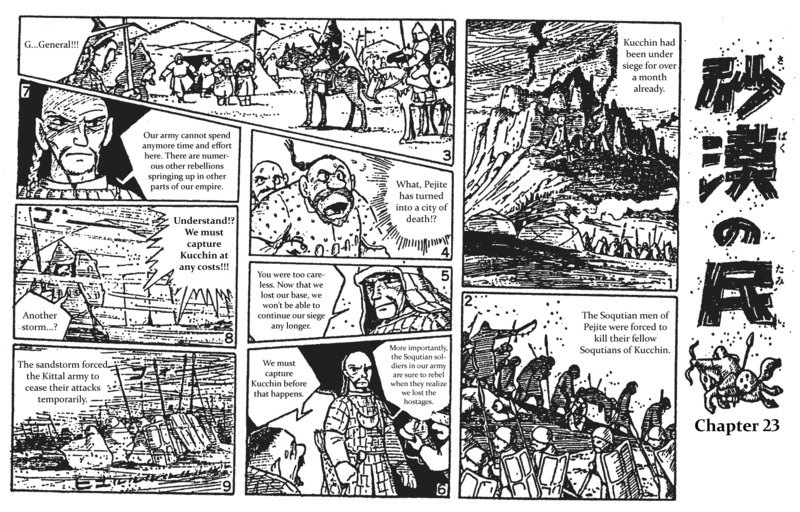 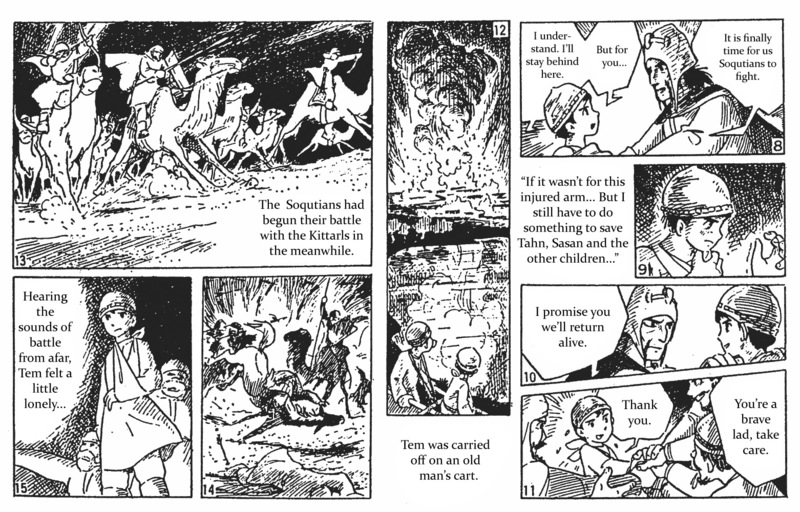 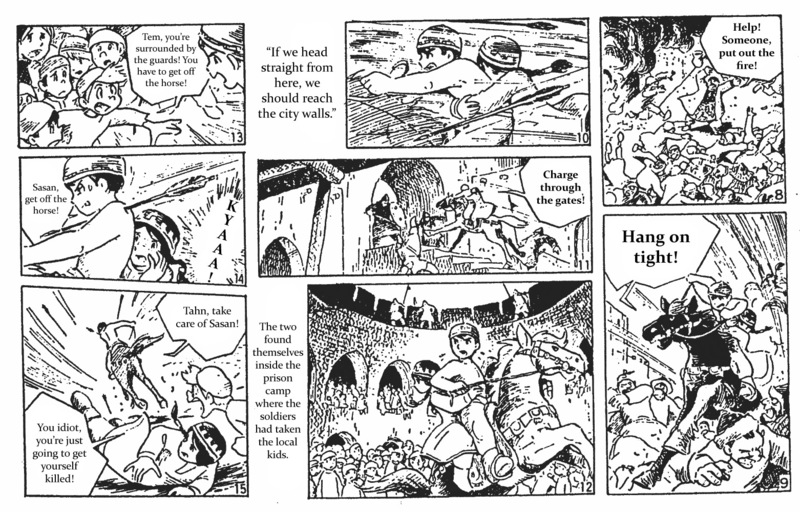 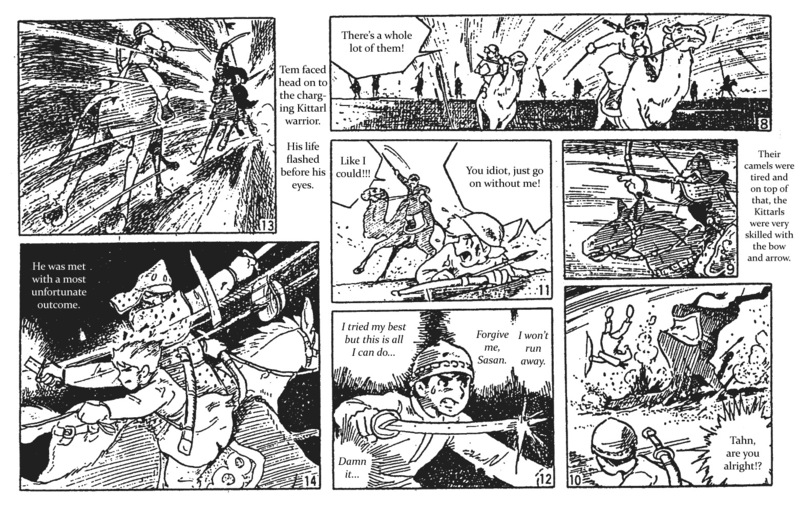 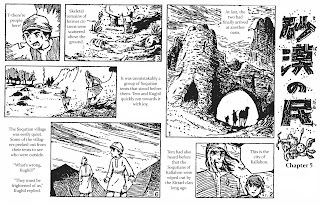 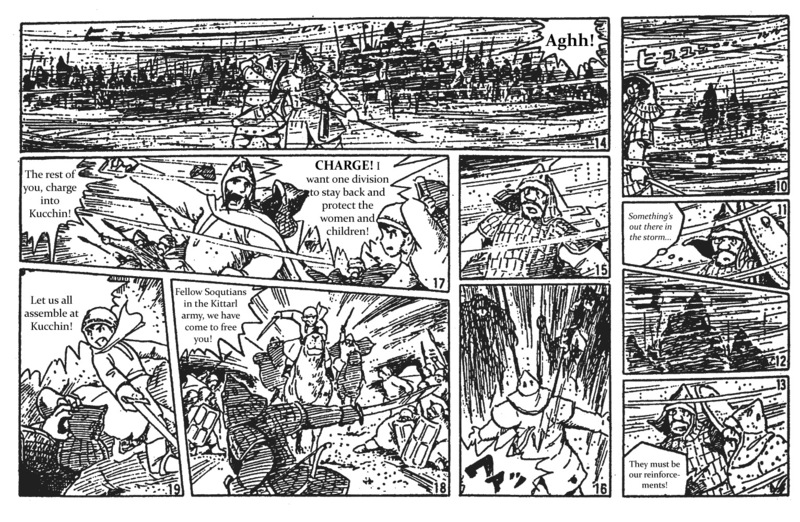 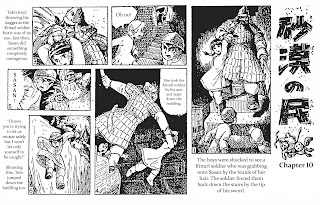 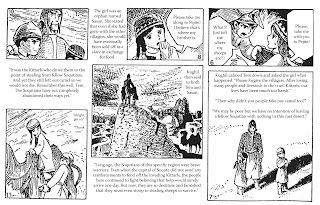 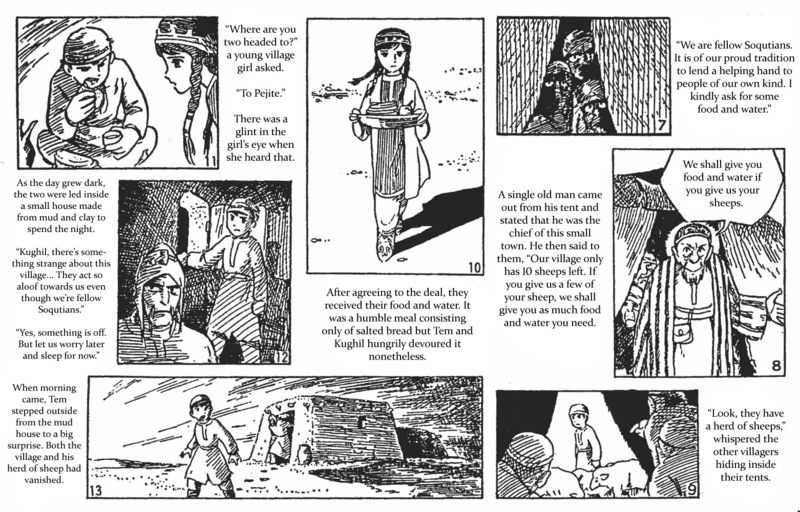 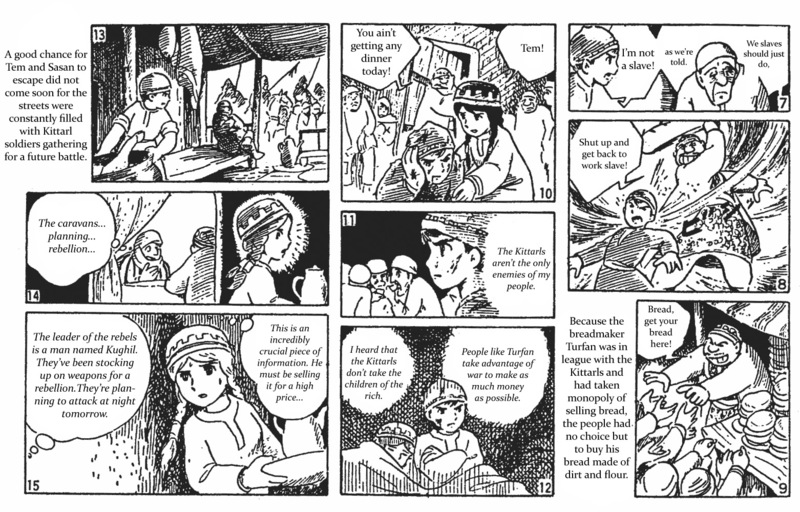 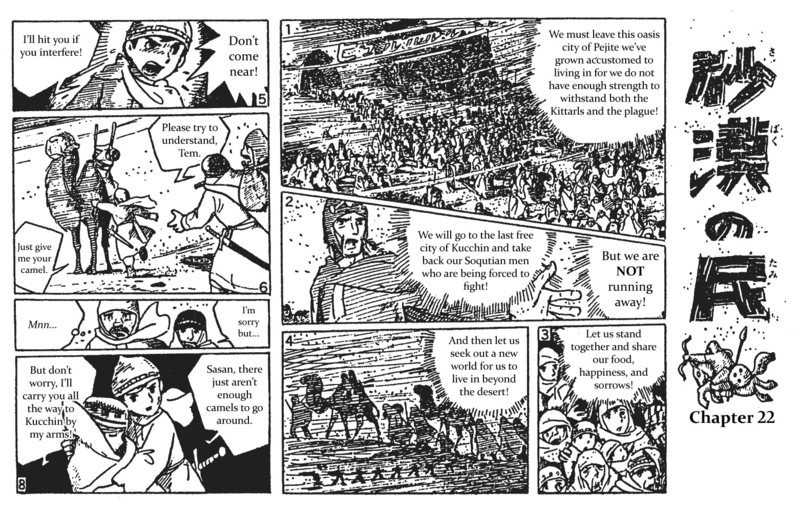 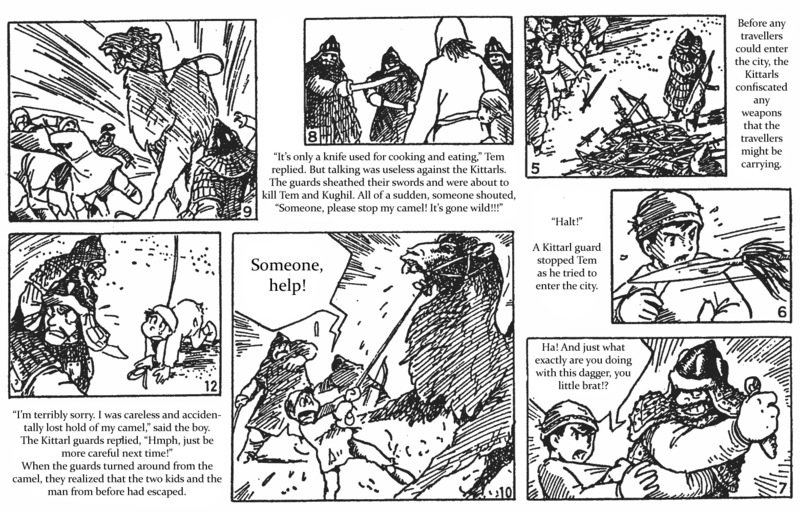 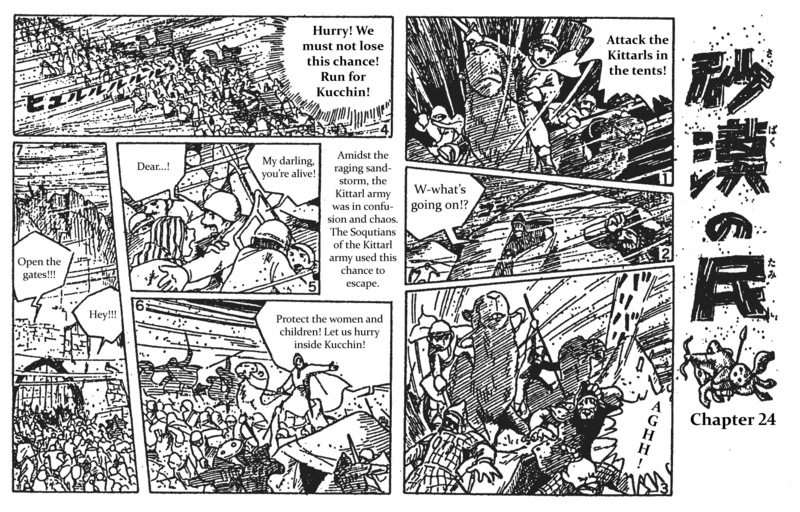 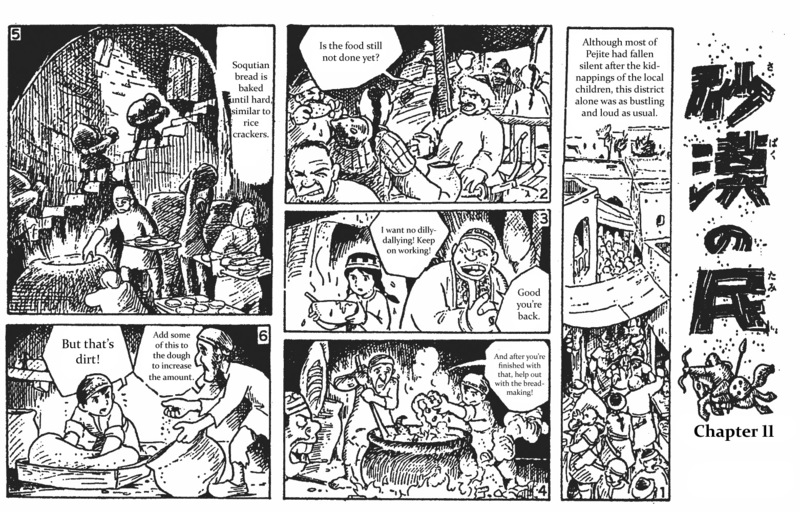 I'd like to continue with our series on Hayao Miyazaki's manga comics with an early landmark, the 1969-70 adventure serial Sabaku no Tami, or People of the Desert. 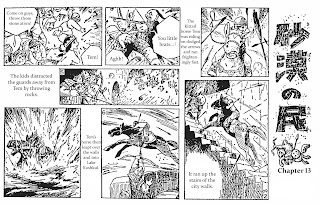 It is the artist's first original manga, following closely in theme and style after the 1968 Toei Doga masterpiece, Horus, Prince of the Sun. 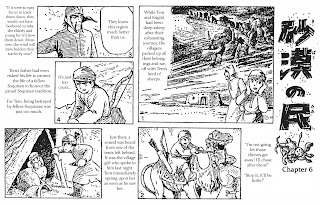 This serial appeared in Shonen Shoujo Shinbun (Boys and Girls Newspaper) in 26 monthly episodes, from September, 1969 to March, 1970. 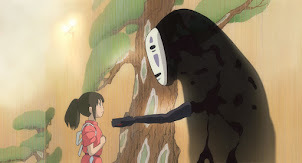 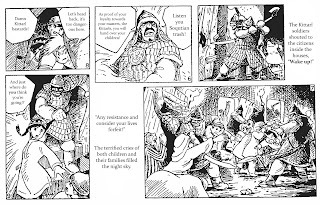 You can see the evolution of the Miyazaki style to comics during this series. 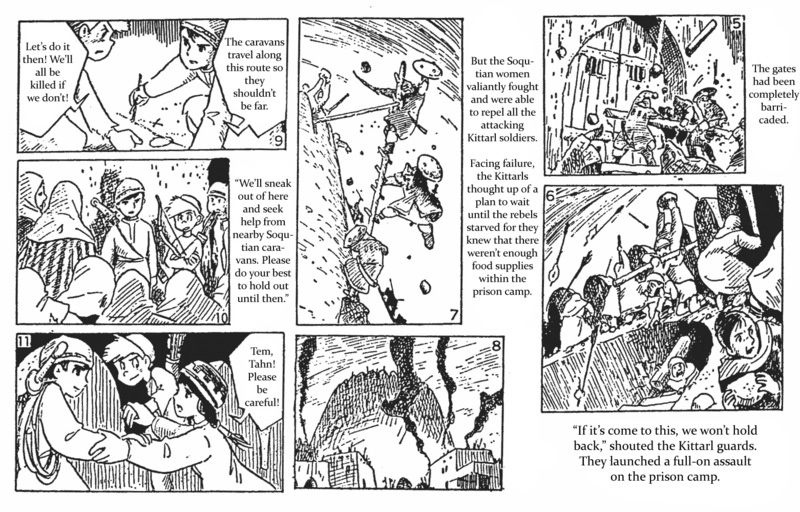 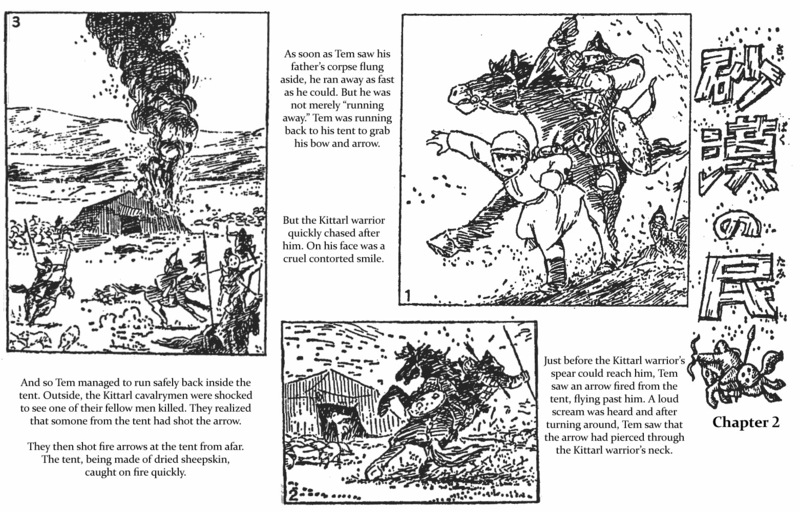 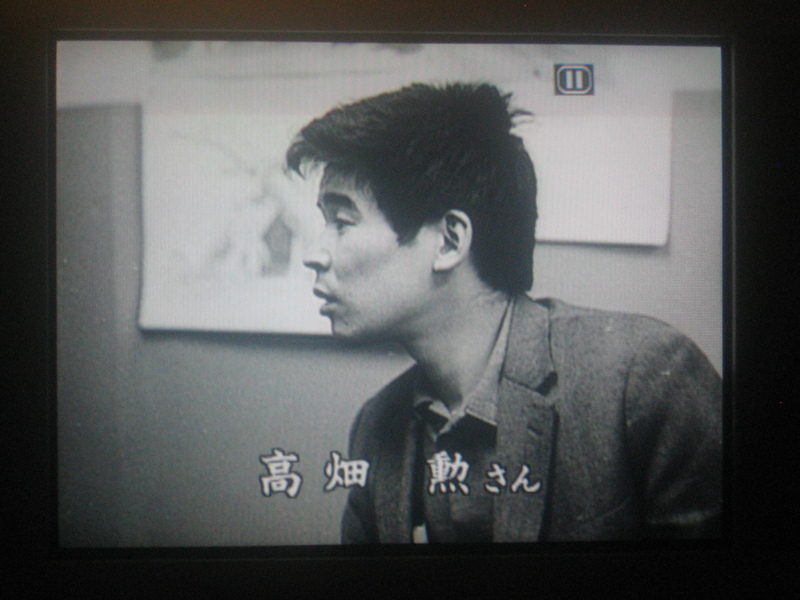 The early episodes are in traditional Japanese comics tradition, with a few pictures illustrating a lot of text. 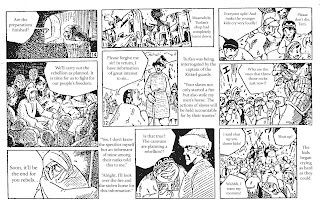 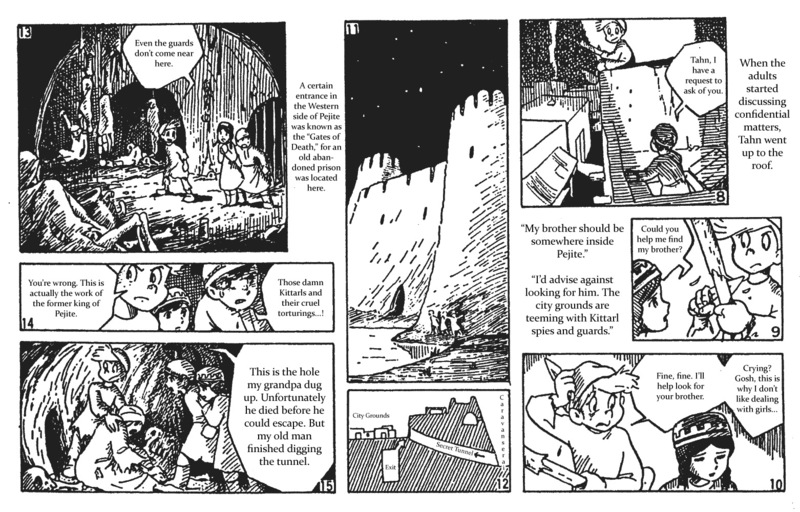 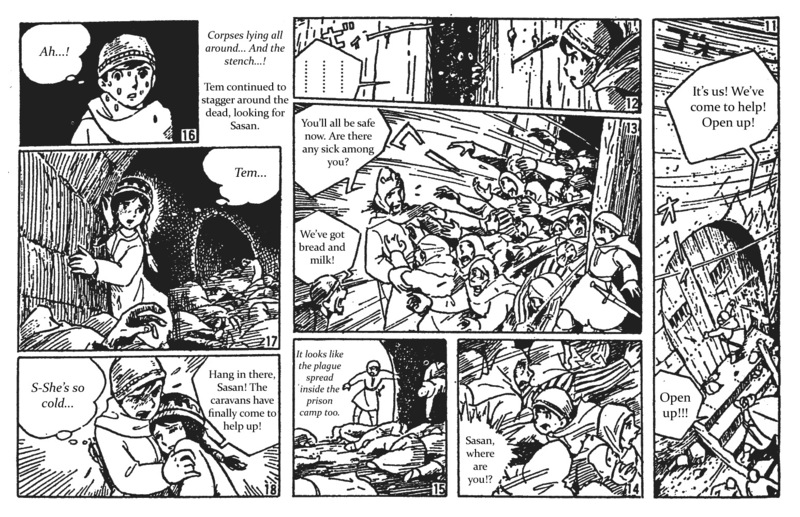 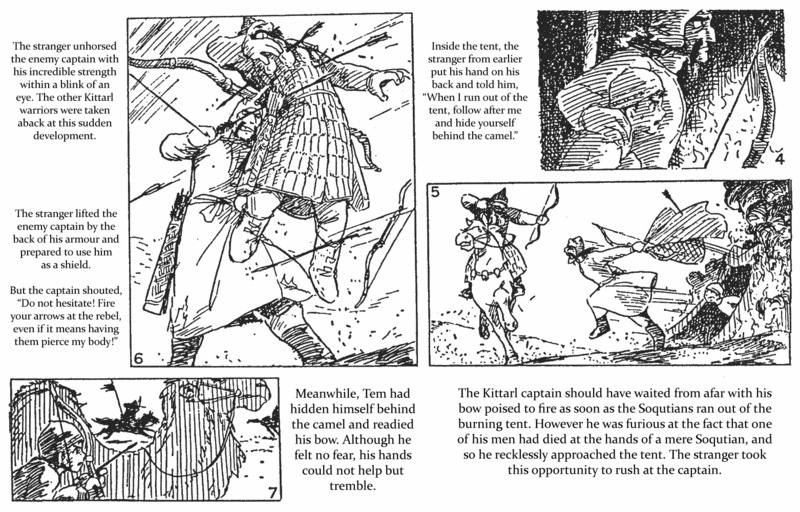 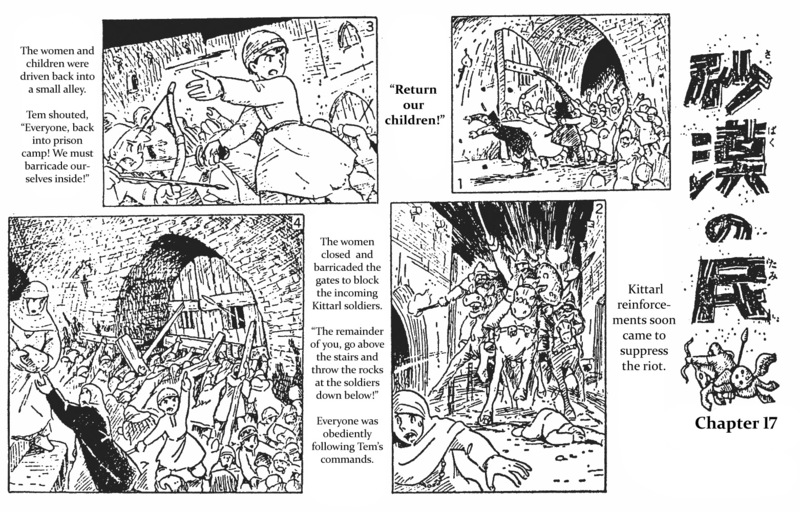 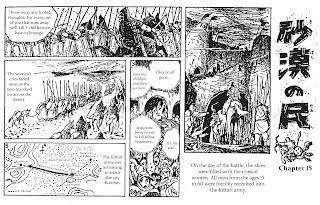 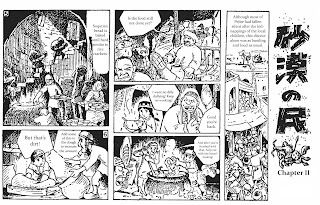 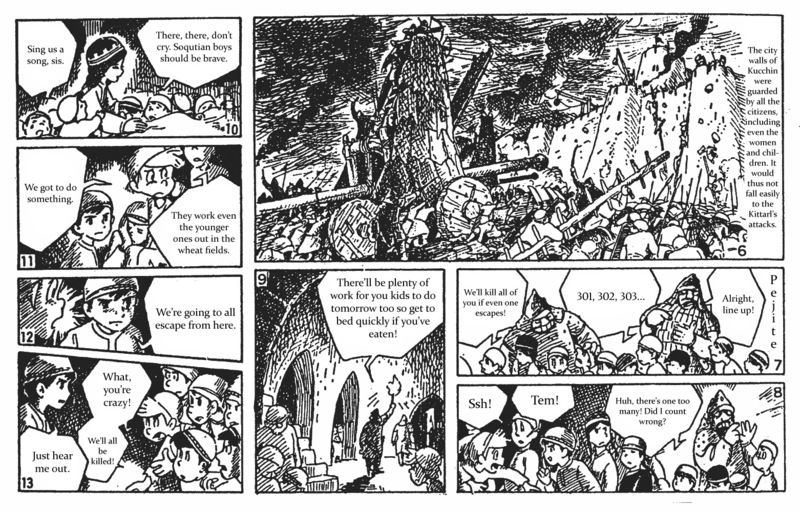 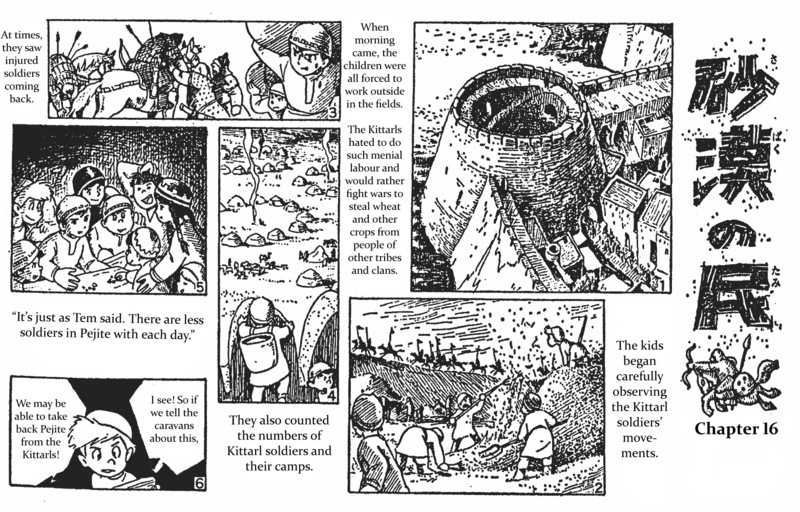 Over time, the panels would increase, and the pictures would crowd out the words, and eventually, we find ourselves with the frenetic, densely packed pages that uniquely define Miyazaki as a comics artist in Japan. 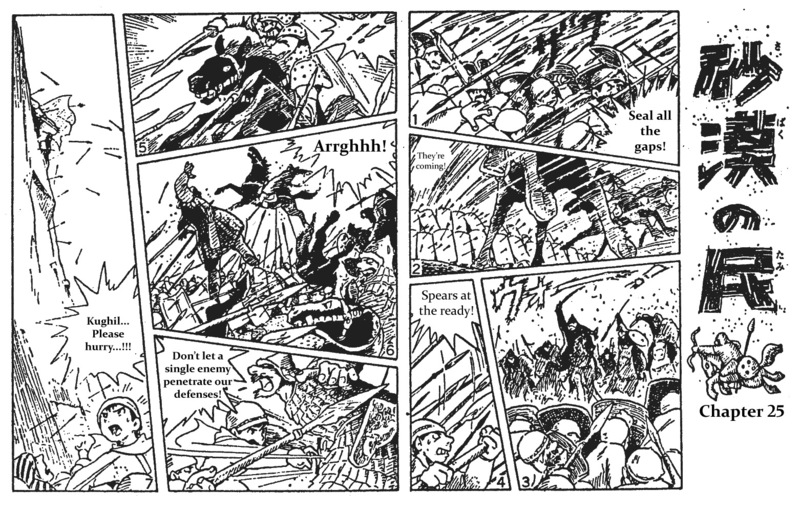 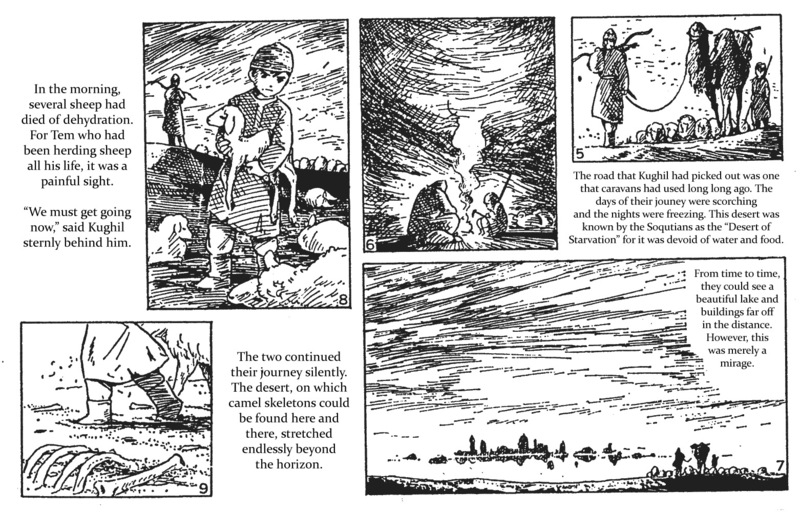 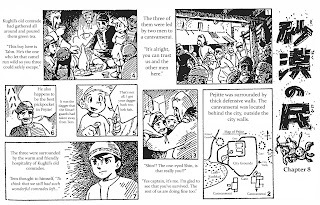 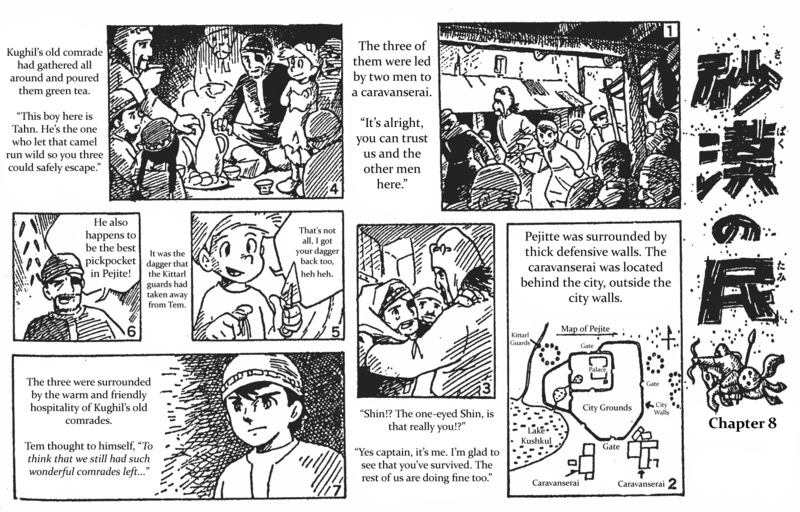 Much of Japanese manga comics are defined by a sparse, zen design, with a few wide, open panels on each page. 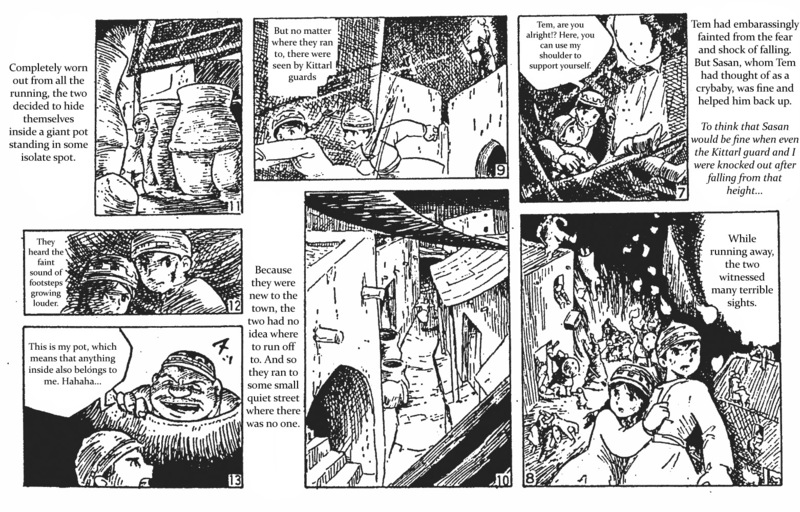 Miyazaki does the exact opposite; he packs in as much as he possibly can into every page. 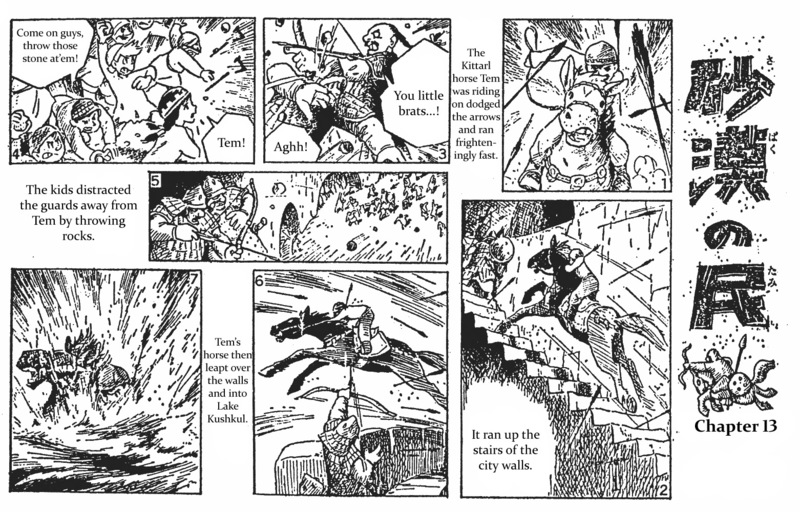 The pages take upon a frantic, almost cubist tension, like Picasso and Jack Kirby smashed together. 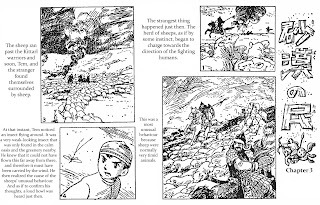 I believe these printed works are a vital component to Hayao Miyazaki's vision and career; his comics are equally important as his television and film animations, and deserve to be known to the wider world. 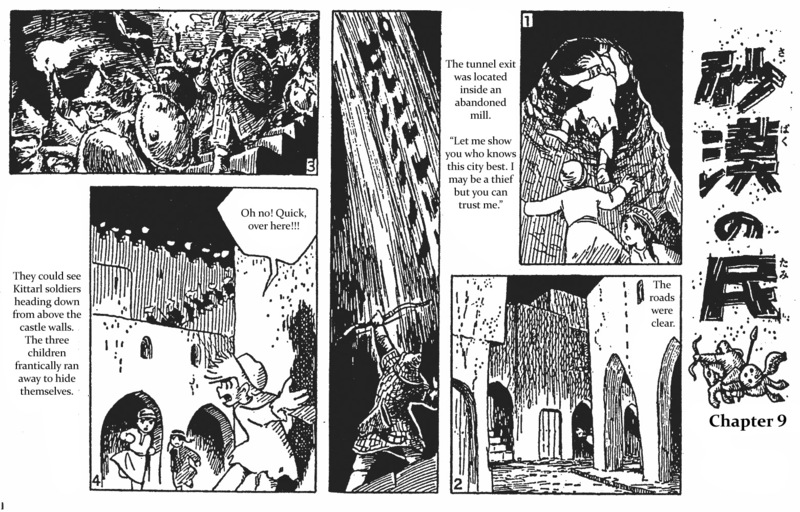 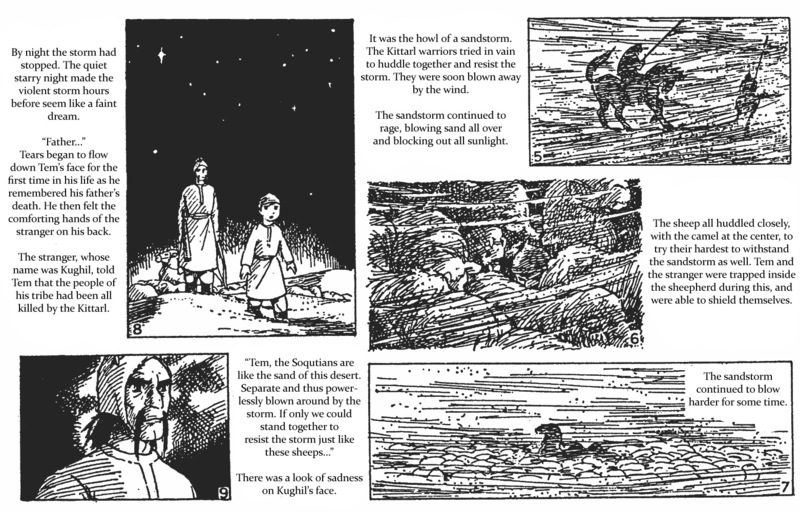 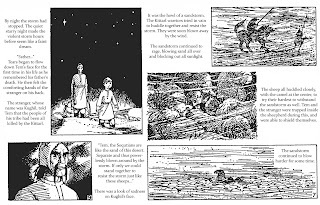 While Nausicaa is his best-known printed work, there are many other classics for us to discover. 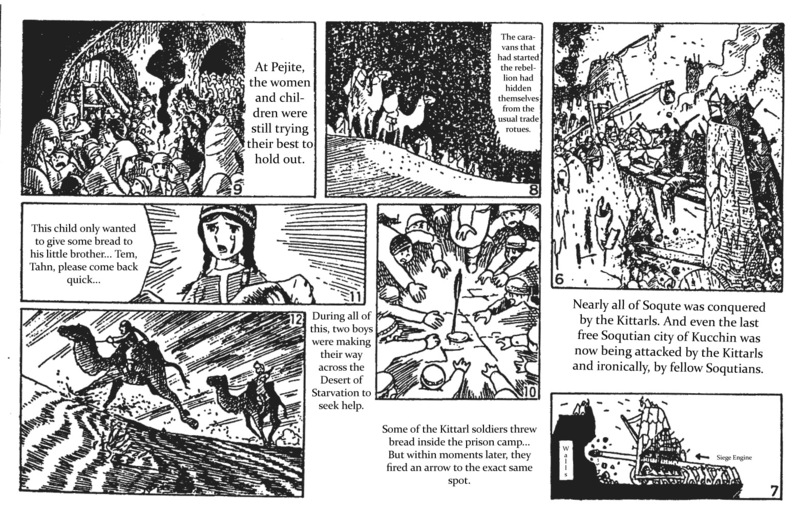 And I believe that People of the Desert is a crucial link in that chain. 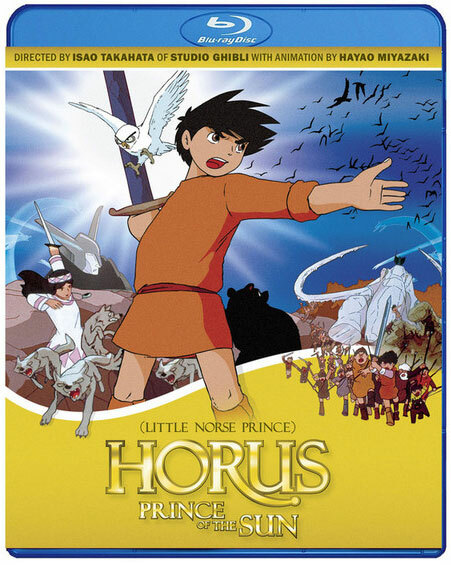 From this serial, the "serious" side to Miyazaki that first emerged in Horus will continue in Future Boy Conan, then Nausicaa, Mononoke, Howl's Moving Castle, and finally resting at The Wind Rises. 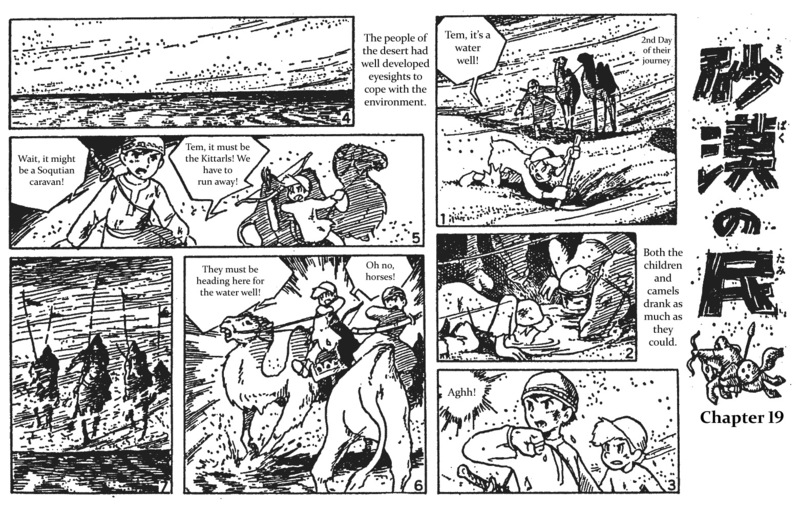 Elements of People of the Desert later appeared in Heidi, Girl of the Alps and Lupin III: Castle of Cagliostro. 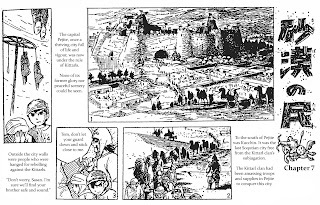 The design of this world, particularly costume design, would play a great influence on Nausicaa of the Valley of Wind. 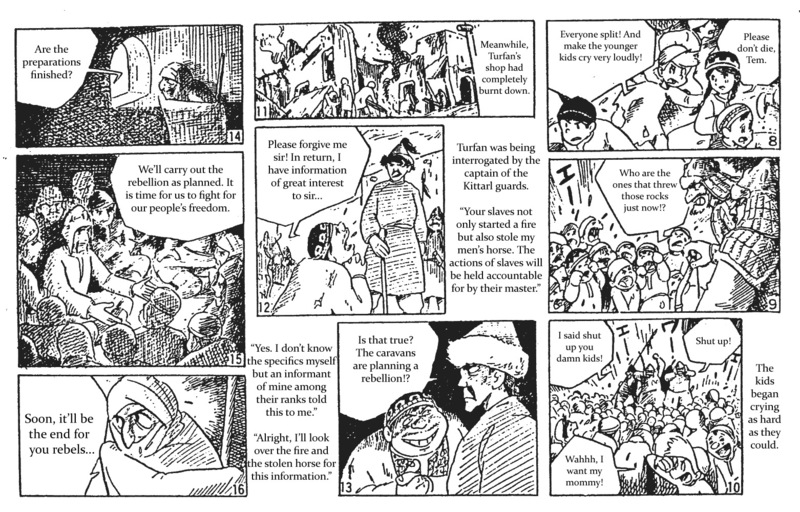 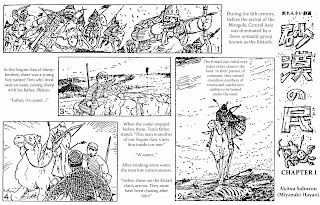 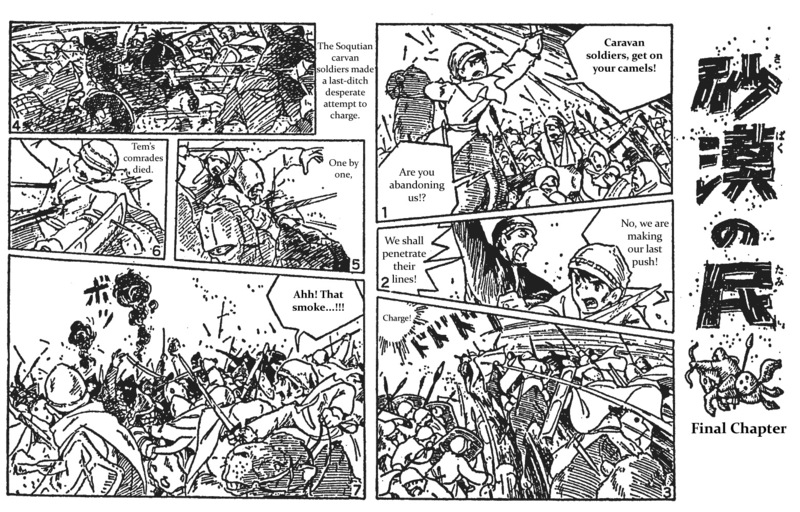 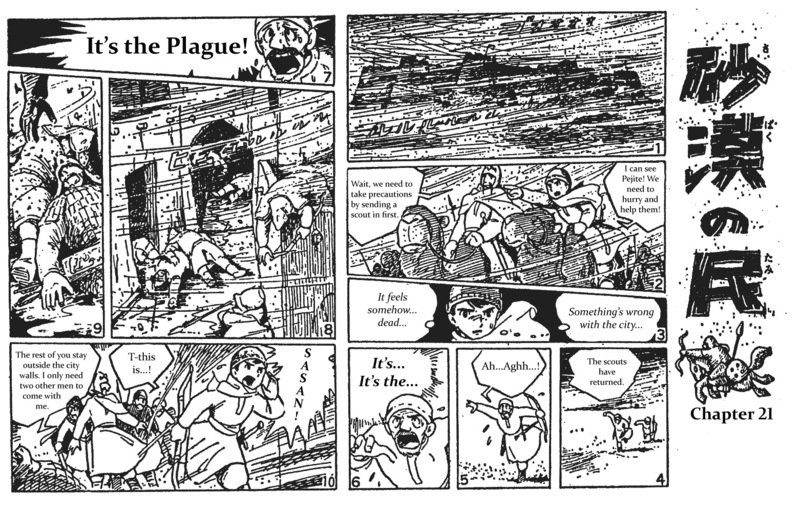 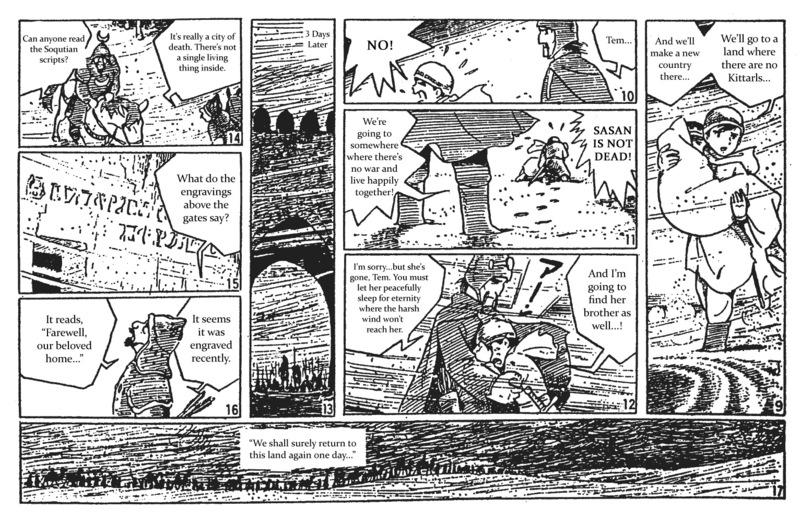 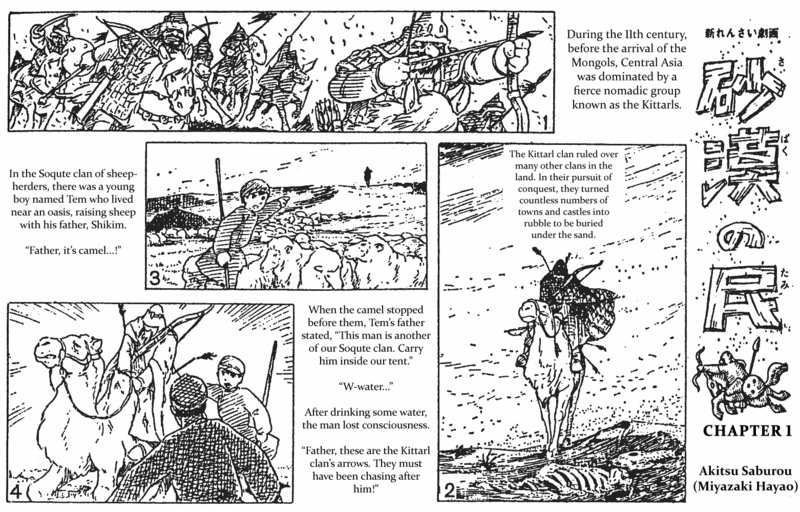 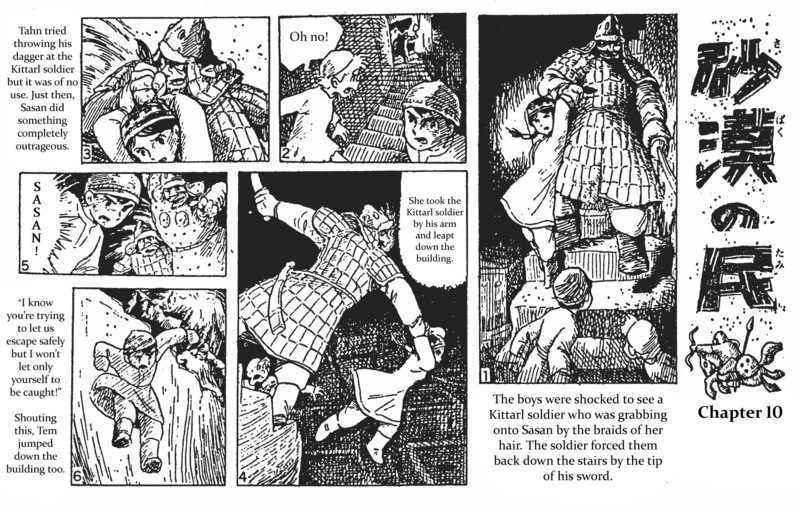 Thematically, this manga continues the general themes of unity expressed in Horus, but the story is largely devoid of the deeper, more complex themes of Hayao Miyazaki's later career. 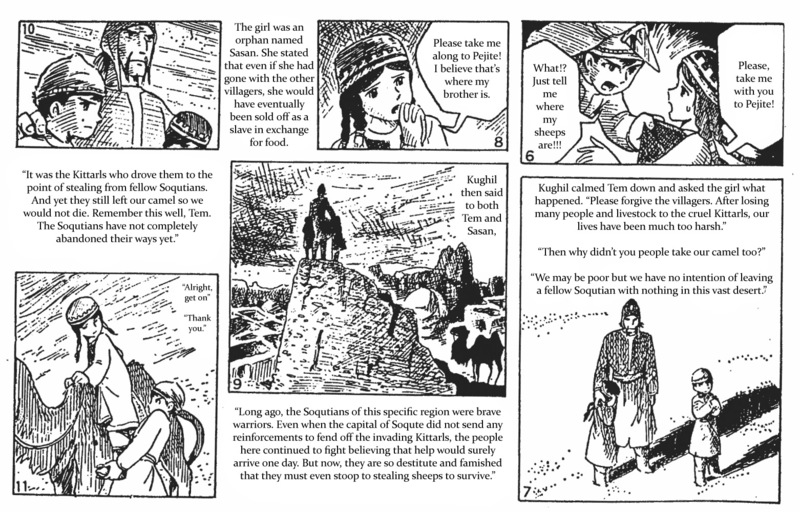 At its heart, People of the Desert is a romantic adventure serial in the finest Errol Flynn tradition. 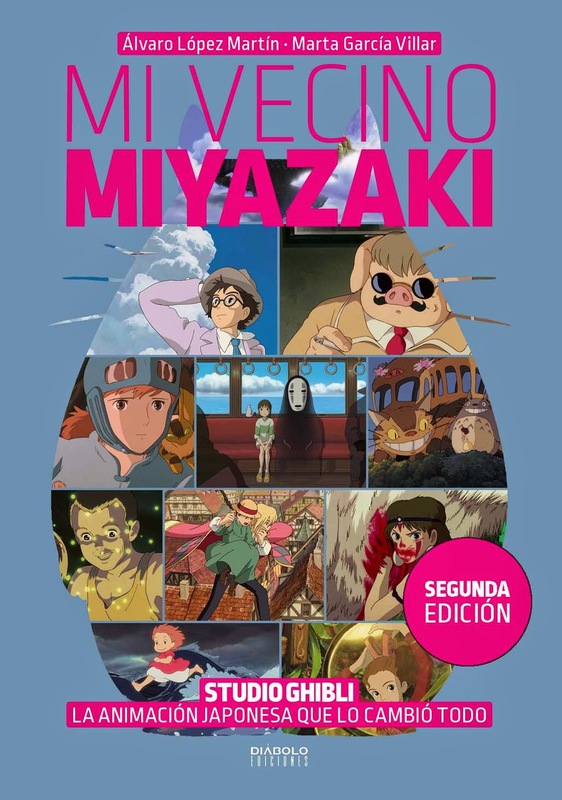 Finally, Miyazaki wrote this serial under a pen-name, "Saburo Akitsu." 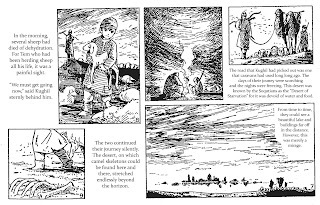 The reasons why remain unclear. 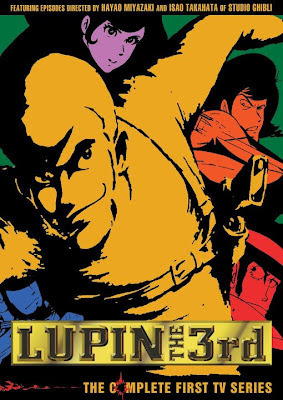 Years later, he would use the same name as the director of the two Lupin III Series Two episodes, Albatross: Wings of Death, and Farewell, Beloved Lupin. 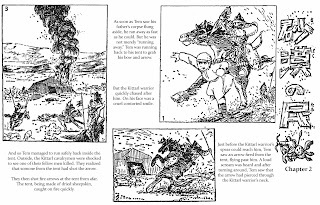 This was very interesting to read. 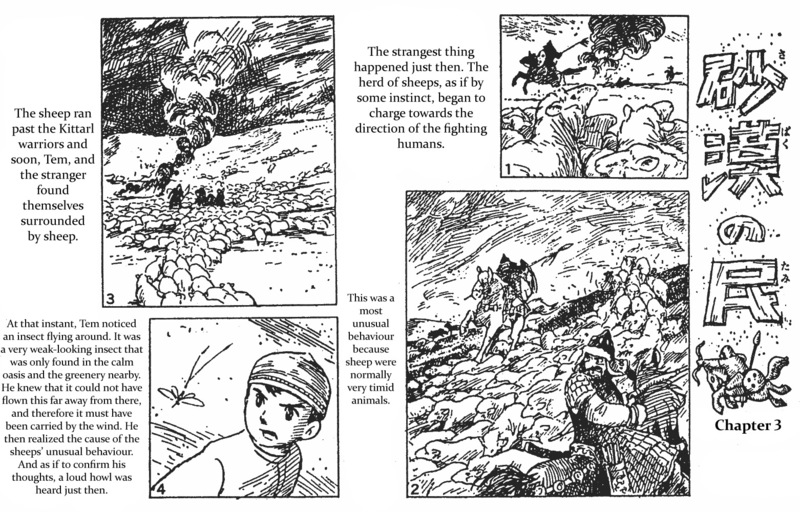 I could easily see the elements later used in Nausicaä and Future Boy Conan. 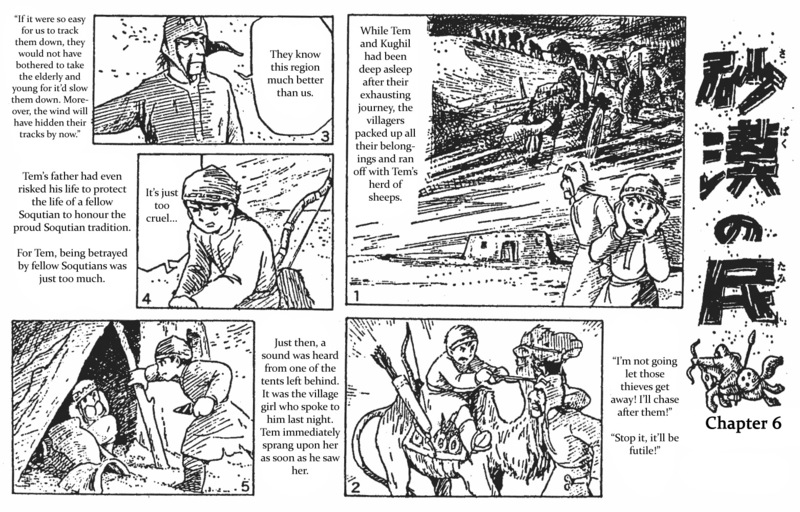 Aside from the obvious name of Pejitei and Tem seemingly being early version of Asbel, I'd say that Tem was more like early Nausicaä, atleast because of his fathers death and going on a journey to help the people of the land. 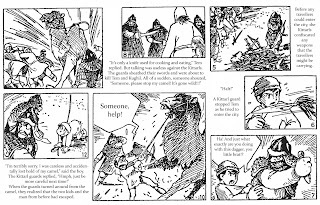 His way of grieving for the dead also reminded me of Nausicaä. 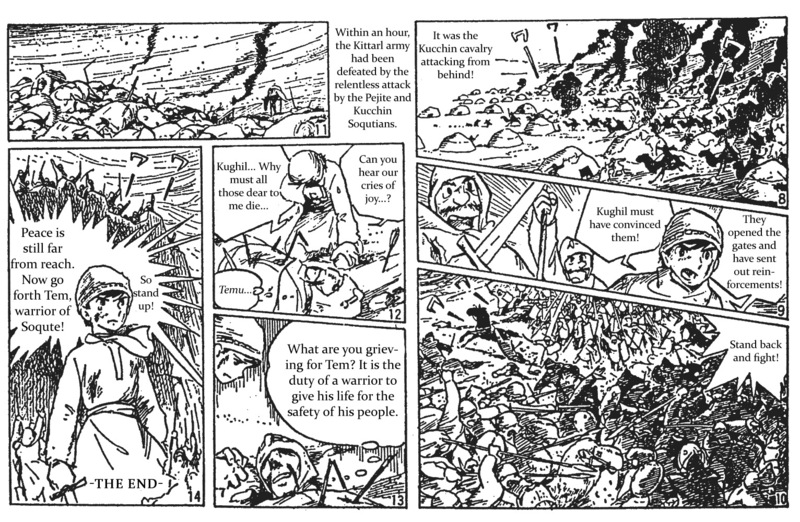 Kughil also seemed to be prototype of Yupa, especially when both died in the end for the greater good of people. 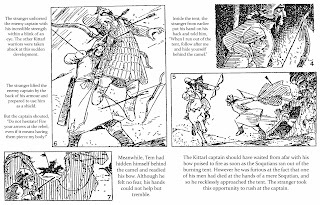 Whole Soqutian/Kittarls set up felt a bit like Dorok/Torumekian set up in Nausicaä too. 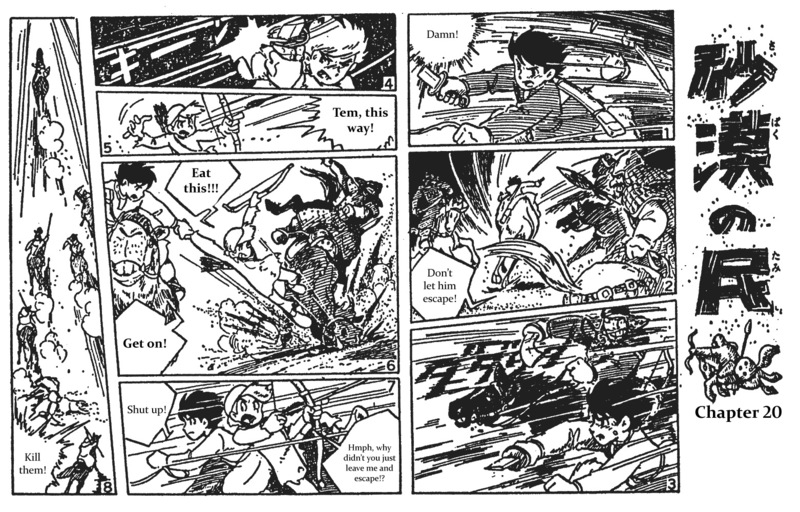 However the elements later used in Future Boy Conan felt even more interesting. 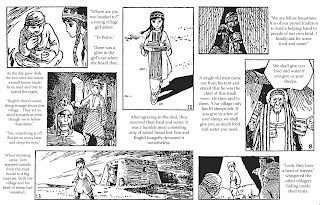 The girl, Sasan, was like an early version of Lana, not only because of the similar outlook, but also because of her search for his brother in Pejitei, as that reminded me of Lana searching her grandfather in Industria. 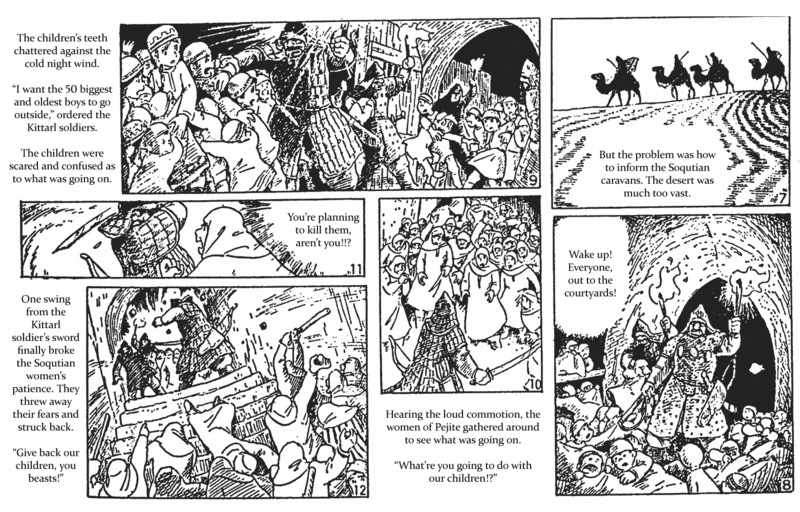 Pejitei seemed to resemble Industria in other ways too. 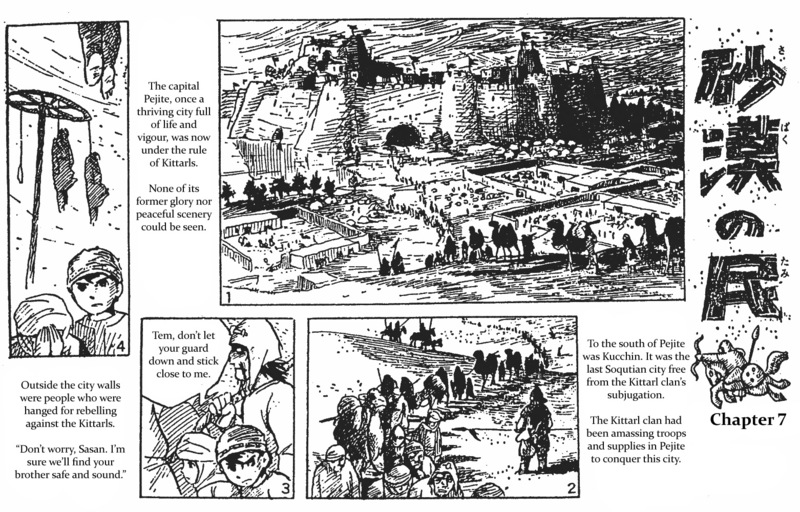 When Tem left Pejitei traveling through the desert in search for the help for people in Pejitei/Industria reminded me of Conan going over similar desert to reach High Harbor (Though Conan left with Lana, when Sasan was left in the Pejitei). 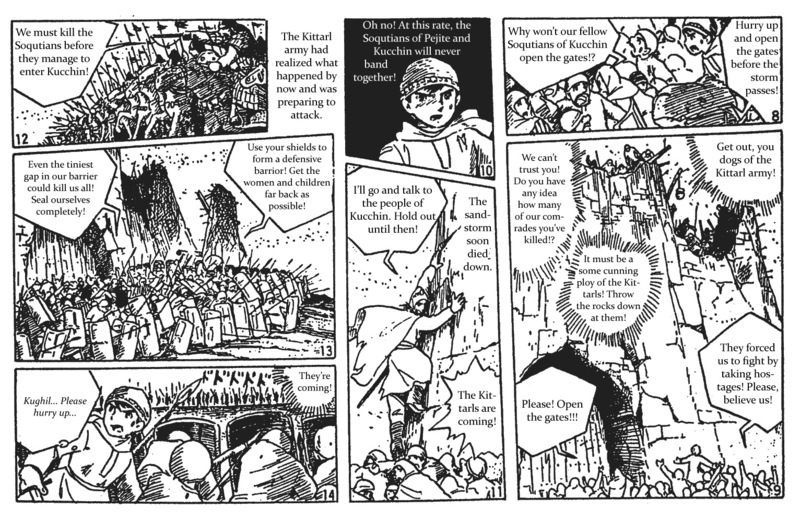 Pejitei and Kucchin also felt like Industria and High Harbor. 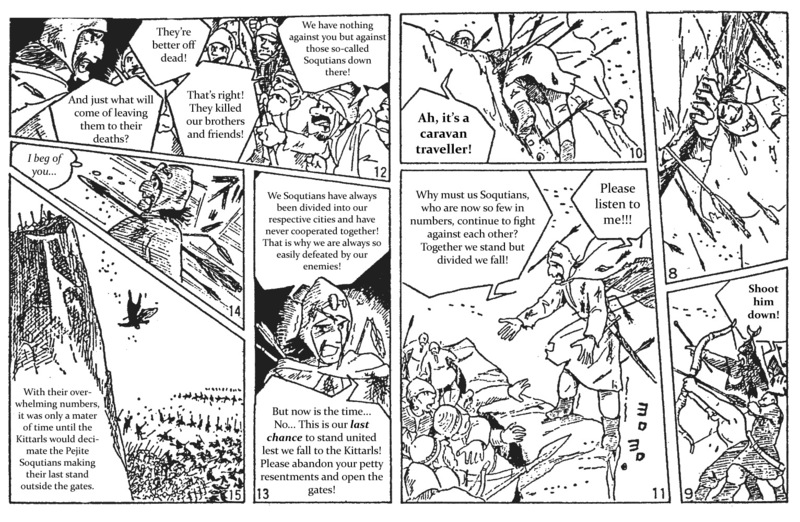 There was some things in Tem too that was later used in Conan. 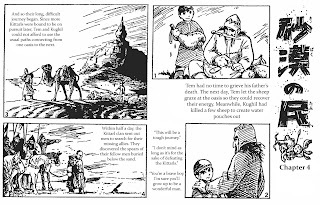 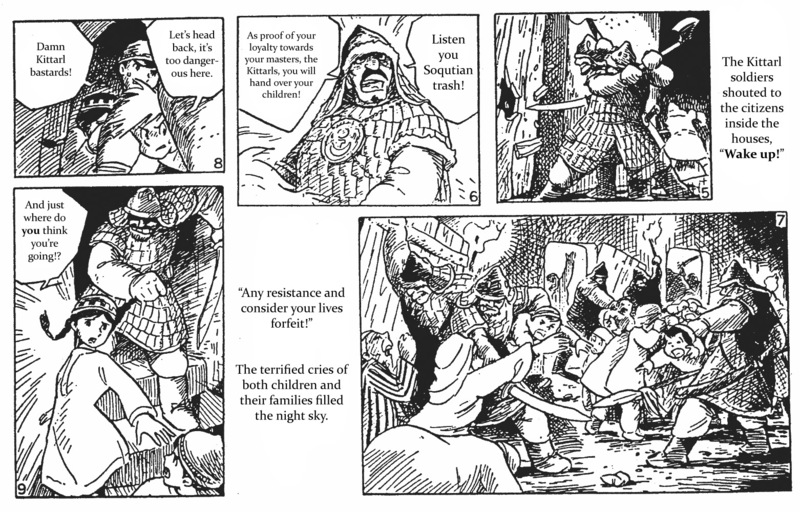 Conan's grandfather died in the beginning of the series, Just like Tem's and Nausicaäs father (in the movie). 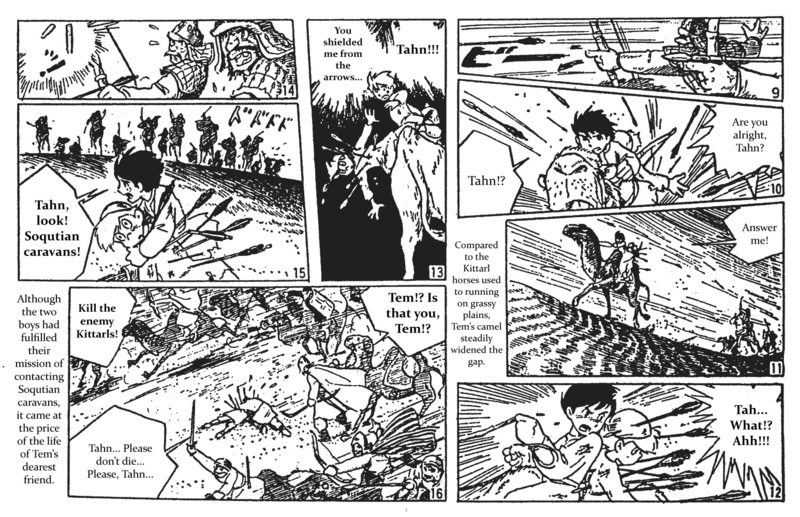 The way Tem treated Sasan and carried her when Sasan was dead, seemed to be exactly what Conan tend to do in multiple occasions (though Lana didn't die). 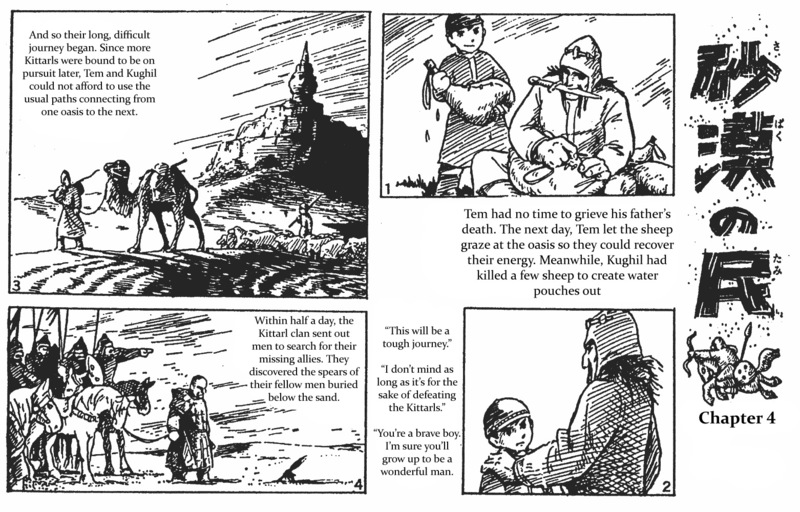 Tem also said he wanted to live his life along happily with Sasan, which was something Conan and Lana managed to do. 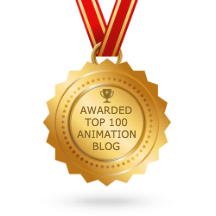 Phew, that took a while, don't know why i wrote all that. 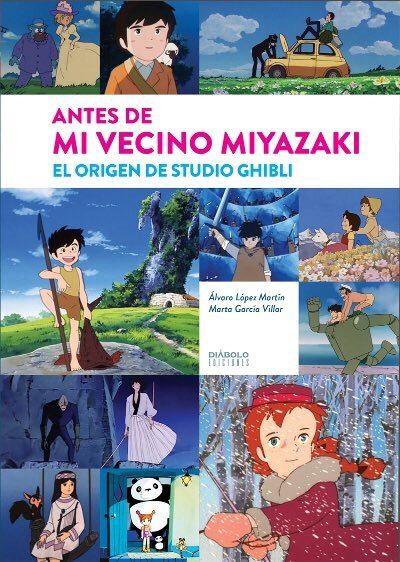 I feel like huge Miyazaki geek now. 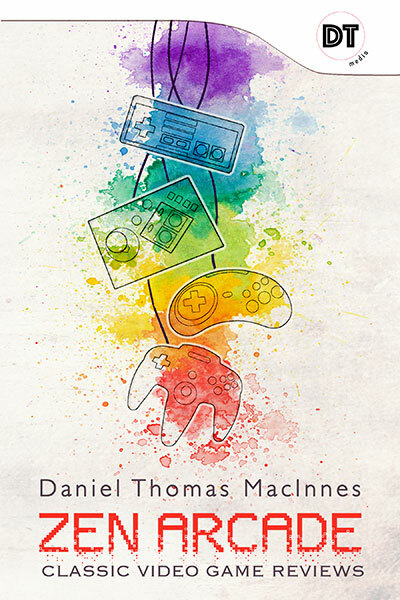 That was an a pretty decent read. 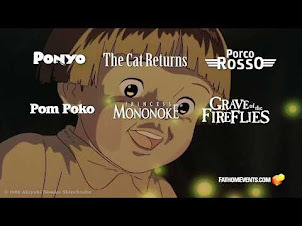 I enjoyed every bit. 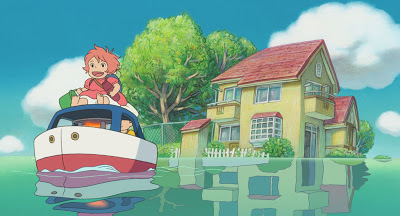 It has Future boy Conan written all over it. 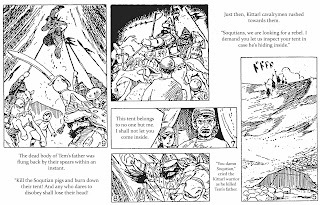 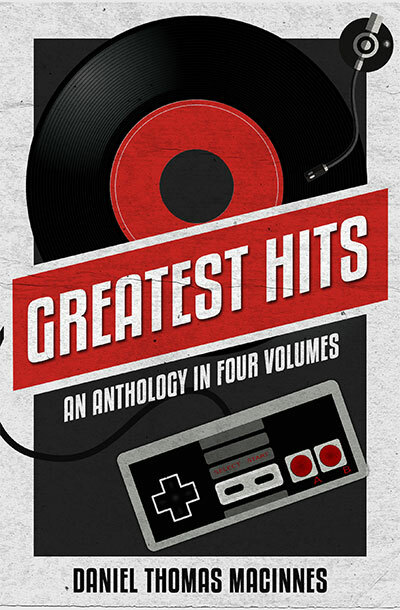 Still, there's nothing like some good old fashion story telling. 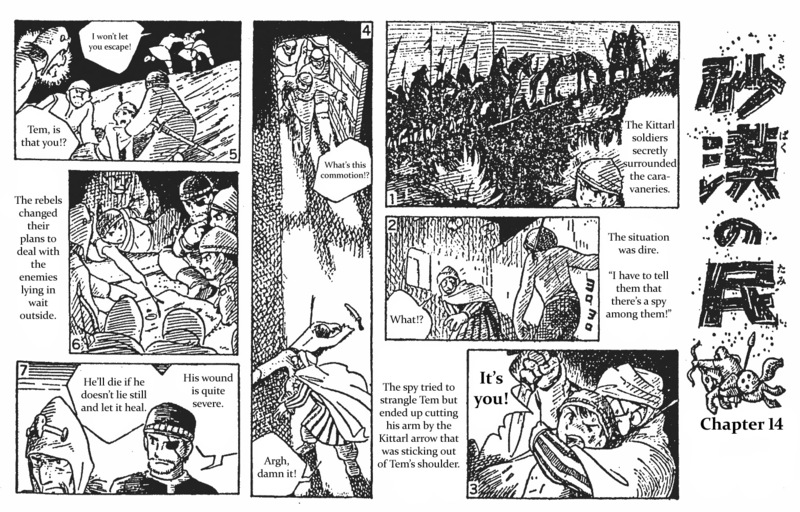 Something that most of today's managa/anime fail to do.